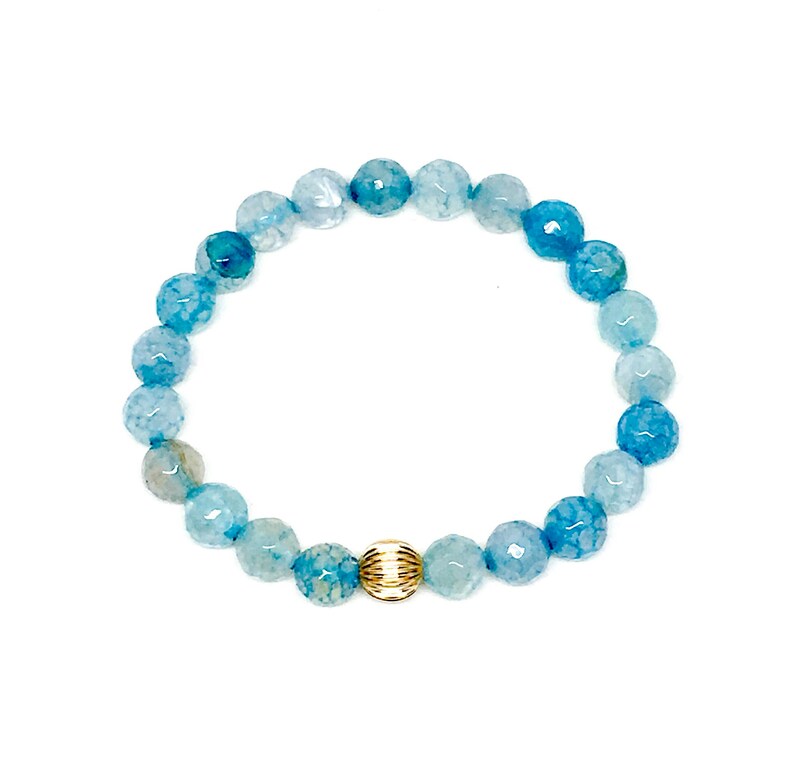 Beautiful, stunning women’s beaded bracelet made with beautiful Blue Fire Agate and 14k Gold Filled bead for the elegant women. Fire agate is a stone of courage, protection, and strength. Mystical lore says that it relieves fears, halts gossip and even reflects any threat of harm back to the source. Fire agate can help with spiritual advancement and progression. It promotes and enhances energy, including meditation, ritual, and spiritual healing energies. It also balances masculine (active) and feminine (receptive) energies. Fire agate is often used in spells to increase skills in communication in writing and speaking. It can also heighten creative visualization. Metaphysical healing lore professes that fire agate enhances all healing energies, and assists with healing of the circulatory system, lymph system, intestines. It is also used in crystal healing take the edge off the emotional charge of problems. Note that healing crystal meanings are spiritual supports to healing and are not prescriptions or healthcare information. Gorgeous women’s beaded bracelet comes in a customized Sill Suede jewelry pouch with our logo.